Mice are happy and playful, active creatures. They are great fun to watch. Some fancy mice are extremely pretty. They get to know their owners and, when well socialised, will come to take treats off you, climb onto your hand and run all over you. Individual mice have different personalities. Some will be keep-fit fanatics, running on wheels and chasing around. Others will be home-makers, building comfortable nests. Some are playful, some are shy. Some are easily socialised, others need more work. The quiet mouse is just as 'normal' as her hyperactive sister. Watching mice play and socialise amongst themselves, you will see a range of behaviour types and temperaments. This is one of many reasons for keeping several mice, rather than just one. 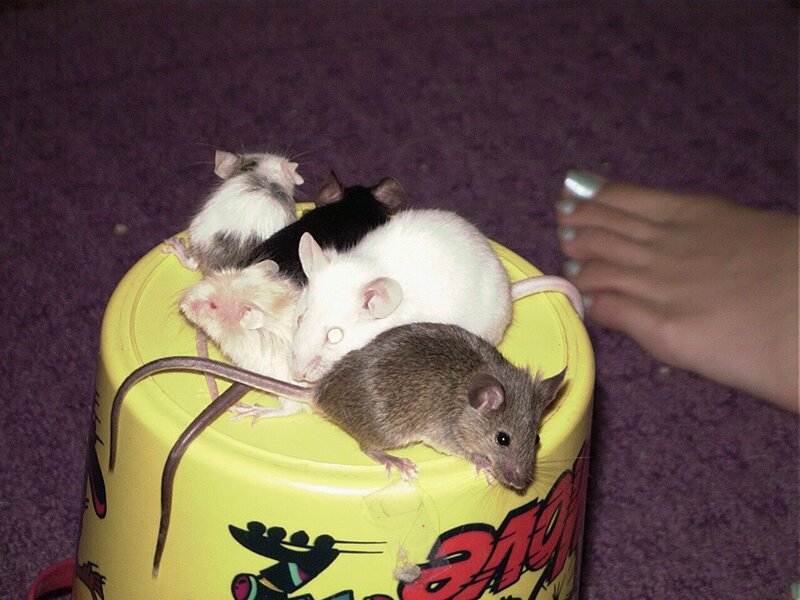 Mice are very easy to keep, undemanding pets. However, they are by nature timid and so you need to spend time getting to know them. They will not play with you in the way that dogs or rats will, but they are rewarding pets nonetheless. Above you see a picture of Ming (white) and her daughter Cinnamon (brown). The black mouse is Blackie, she is like a sister to Ming. The other two are babies.